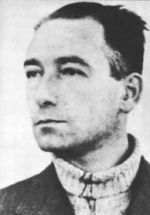 One of the Netherlands’ most infamous traitors, Anton van der Waals, was shot on this date in 1950. An electrician with a misfiring career, van der Waals joined the Dutch fascist party NSB in the interwar years. The German invasion of 1940 gave this small-timer a (short) lease on espionage stardom, plus a lasting purchase on his countrymen’s hatred. “Had I read of my adventures in a book, I would not have believed they could all be true,” he would one day muse from the self-reflective confines of his own dungeon. Although he would also have a brief turn after the war as an Allied spy upon his former masters, those adventures in the main consisted of posing as a Resistance member for the purpose of informing on his “comrades”. He was repeatedly, devastatingly good at this evil game. At trial after the war, van der Waals was slated with betraying at least 83 anti-fascists, at least 34 of whom were killed. The true extent of his activities, however, is uncertain and it is commonly thought that the ranks of his victims were well into the hundreds. Van der Waals was shot on the Waaldsdorpervlakte, a site noted for the 250+ Resistance members executed there.